Okay. Maybe I am crazy. | there's no place like gnome. Okay. Maybe I am crazy. Maybe I’m crazy because I’m going to dork-out about wrapping paper. 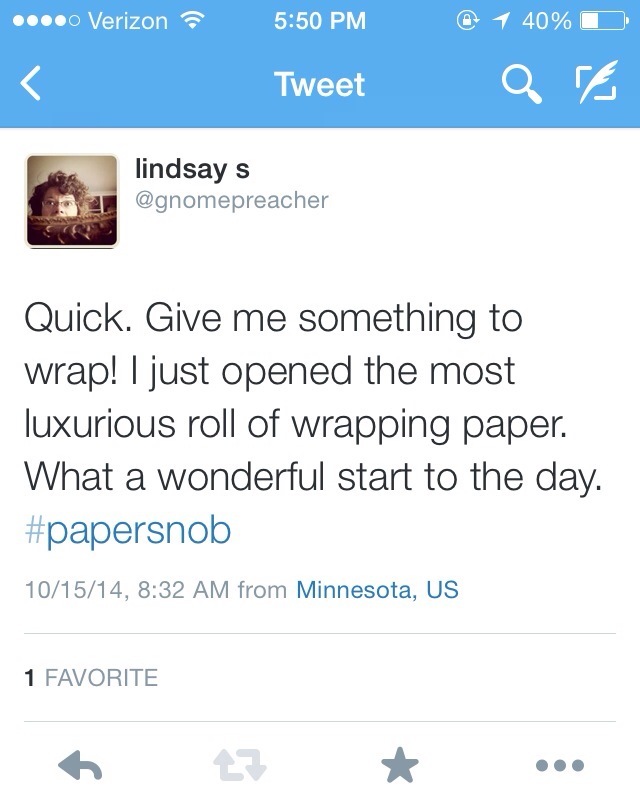 In summary: I always have loved wrapping gifts. But today it all changed. I had a bridal shower gift to wrap and get in the mail. I went for a new roll of wrapping paper I bought many weeks ago at Marshall’s. I bought it because it was blue and white polka dot, not because I knew I would never wrap gifts in the same way ever again. I took off the plastic wrapping and immediately knew that this roll of wrapping paper was different. It felt different. Smoother. Matte. Different. I unrolled the amount I needed and went to cut. Now, I love it when you can take the scissors and zoom across the paper. With a regular roll of wrapping paper, sometimes it works. Sometimes it leaves your edges jagged. Oh, buddy, not this time. The scissors sailed across the roll with such ease. I always have wondered what people meant when they said something cut like butter; now I know. Later, someone responded to the tweet and asked about the wonderfulness. It caused me to do a little investigating about this new-to-me paper product. Turns out this was no ordinary gift wrap made from trees; this was gift wrap made from stone. It’s called stone wrap and it’s made from some form of salvaged limestone. It creates a paper that is matte, smooth, waterproof, nearly tear-resistant, and extremely durable. A paper that is absolutely wonderful. I cannot begin to tell you how exciting this is for me. ← Proof that I’m not crazy.